After breakfast you will be picked up from your hotel in Arusha and transfer to Arusha National Park where you will do all the park entrance formalities at the Ngongongare Gate. After completing all formalities you will walk under the Momella Gate to begin your trek. You will walk over Ngare Nanyuki River and soon pass open grassland where you can see Buffalo, Warthogs, Giraffes and sometimes Elephants. You will continue with a steady climb through the Montane forest. In the afternoon you will pause for enjoy a picnic lunch and later continue through the less dense forest where you can spot birds and monkeys including the Black & White Colubus monkey. By mid afternoon you will have closer views of Meru’s towering cliffs and Ash Cone. 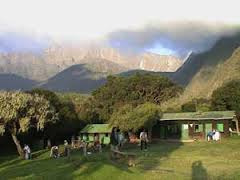 You will arrive at the Mariakamba Huts for dinner and overnight. The Huts are situated in an idyllic grassy glade and clients will reach in time to enjoy the afternoon sun and beautiful views over the surrounding plains between Mt. Meru and Mt. Kilimanjaro. If clients are lucky they may see some animals walk through the Mariakamba Huts. We leave the Mariakamba Huts just after breakfast and ascend steeply to the crater rim which is called Elephants Ridge (In Swahili; Ngongo wa Tembo). 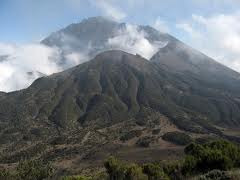 Follow a steep path through attractive open lush Montane Forest to reach the giant heather in the moorland near the saddle between Little Meru and Meru. A hot lunch will be ready for you when you arrive at the Saddle Huts. 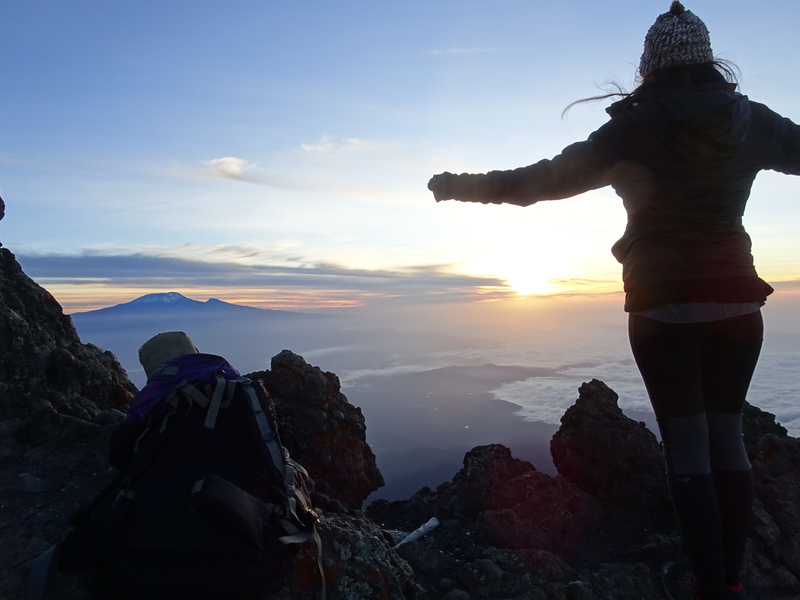 You will have the afternoon free to rest and enjoy the views, but energetic trekkers can make the short climb to the nearby summit of Little Meru (3,820m/ 12,533’) for superb views just before sunset. 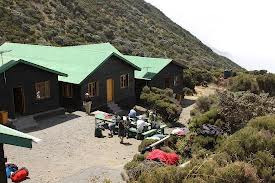 From Saddle Hut the peak of Little Meru can reached in approximately an hour and offers impressive and imposing views of the summit and the sheer cliffs of the crater's inner walls. At this location which displays vast prairies and bushes, you will find them regrouped to face the cold and wind. At night, the sky is covered with thousands of stars and you can admire the famous Southern Cross and hear the distant cries of jackals. The next morning, you can not miss the presence of buffalos, or elands.